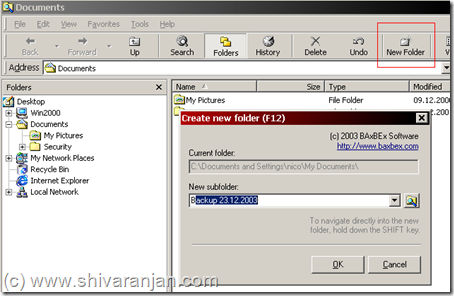 To create a folder in Windows we have to access File Menu of the Windows explorer or use the context menu that appears when we right click inside a folder which sometimes gets painfully bad if you have to do this over and over again. 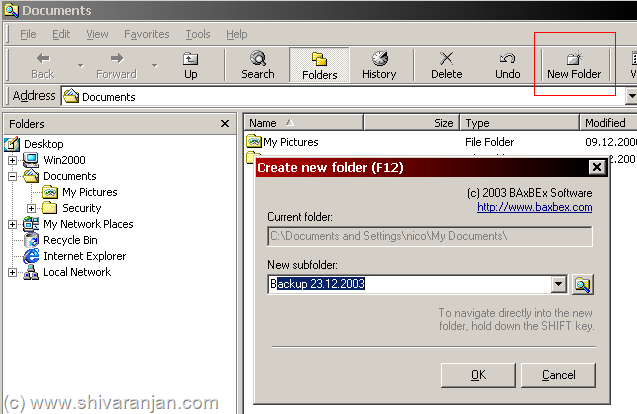 bxNewFolder is a free software that will add “New Folder” button to the toolbar of Windows Explorer. It also adds the hotkey F12 using which you can quickly create folders in Windows explorer. This works in Windows 98, Windows ME, Windows 2000 and Windows XP but does not work in Windows Vista. So if you are not using Windows Vista then this tool is highly recommended. will cover is ghost. And it really makes me wish some Keith Richards would come down and smash some divine Pirate-smackdown on them. An overgrown boy hobo and his feebleminded midgetsidekick lurk in national parks and steal pic-a-nic baskets.